Yom Kippur, one of the holiest days on the Jewish calendar, starts at sundown on Friday and lasts through sundown on Saturday, and since Jewish law prohibits any work to be done until Saturday evening, you’ll need to plan ahead if you want to break fast with a delicious meal. 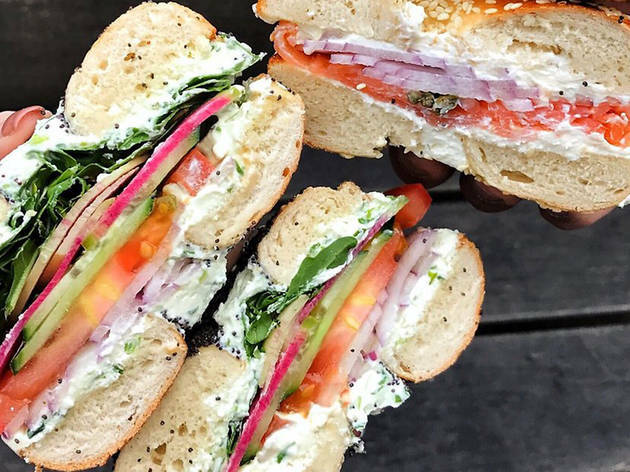 These five Bay Area delis and bakeries have you covered with catering menus that feature comforting dishes that are either easy to reheat or don’t need to be heated at all. Some will even deliver so you don’t have to schlep it all home. May you have an easy fast and g’mar chatimah tovah! Wise Sons will cater and deliver all of your favorite Jewish comfort food, including braised brisket, matzo ball soup, noodle kugel, smoked fish platters, babka and more this weekend. Just fill out this form at least 48 hours before you want to pick your meal up or make it even easier on yourself and have it delivered. Want to eat out? You can enjoy the full breakfast, lunch and dinner menu all day at the 24th Street deli location. Wise Sons' challah is also available for $9 at all locations, including the new bagel shop in Larkspur. This kosher bakery on 6th and Minna has only been open since December, but is already proving to be a dream come true for anyone craving authentic Israeli baked goods. The catering menu offers a variety of sweet and savory options like burekas (handmade layered phyllo dough stuffed with fresh savory ingredients), wild smoked salmon platters and rogolach, as well as salads, hummus and tahini dips, pitas and bagels. Order 24 hours in advance, but you’ll need to pick up your order by 2:30pm on Friday. 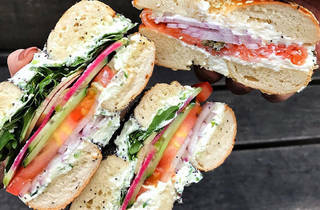 It's worth a trip to the Outer Richmond to break your fast with Marla’s mouthwatering bagel platter, which includes seeded, poppy, salt and sesame bagels, house cured smoked fish, housemade farmers cheese, pickled red onions and seasonal pickled vegetables. Marla also has housemade challah and lots of tasty cakes and tarts. But mach shnel (hurry up)! Orders are being accepted through Wednesday, September 27, and may be picked up on Friday or Saturday from 9am to 9pm. If you’re an East Coast transplant, Miller’s in Nob Hill is your best bet for satisfying all your Jewish deli cravings. The extensive menu has everything you could possibly want, including house made knishes and latkes, hot corned beef, brisket and pastrami sandwiches, whitefish salad bagels, chocolate and cinnamon babke. Miller’s is open Friday and Saturday until 9pm, and you can eat in, get it delivered or have it catered. If you’re looking to cater your Yom Kippur break fast in the East Bay, Saul’s Deli is an excellent choice for authentic Jewish comfort food like chopped liver and rye, latkes with applesauce and sour cream, pickles, knishes, hummus platters and cheesecake or rugelach for dessert. Be sure to get your order in soon. Saul’s closes at 7pm on Friday and is closed all day Saturday.